Our goal at Orthodontics of San Mateo is to create beautiful, healthy smiles for our patients that will be valued for a lifetime! 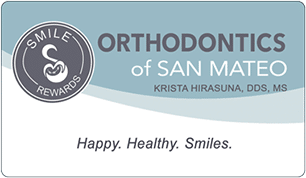 Dr. Krista Hirasuna is a Board Certified Orthodontist, certified by the American Board of Orthodontics (ABO). This certification process signifies a unique achievement that only 1 out of every 3 orthodontists has completed. Not only have Board Certified Orthodontists excelled through rigorous additional schooling beyond that of an average Orthodontist, but they have demonstrated a high quality of patient care, and dedication to maintaining up to date knowledge of new technology and techniques. Learn more about Board Certification here.